The Kafue River is the longest river lying wholly within Zambia at about 1,600 kilometres (990 mi) long. 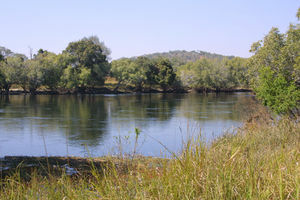 It is the largest tributary of the Zambezi, and of Zambia's principal rivers, it is the most central and the most urban. More than 50% of Zambia's population live in the Kafue River Basin and of these around 65% are urban. It has a mean flow rate of 320 m³/s through its lower half, with high seasonal variations. The river discharges 10 km³ per year into the Zambezi River. The Kafue River rises at an elevation of 1350 m on the relatively flat plateau just south the border of Zambia and the Democratic Republic of the Congo, 120 km north-west of Chingola in the Copperbelt Province. The area is Miombo woodland on the Congo-Zambezi watershed, with many branching dambos lying 10 to 20 m lower than the highest ground, producing a very gently undulating topography. The river starts as a trickle from the marshy dambos (the Munyanshi Swamp is a tributary) and with little slope to speed up river flow, it meanders south-eastwards sluggishly and within 50 km has the character of a mature river. The area receives about 1200 mm rain in the rainy season, and the river's channel soon reaches 100 m wide with a floodplain of fluvial dambos 1–2 km wide. Before the river reaches the Copperbelt towns, however, it loses its wide floodplain, the channel narrows to 30–40 m and it meanders less, in a shallow valley only 40 m or so lower than the surrounding plateau. It flows close to the Copperbelt towns of Chililabombwe, Chingola and Mufulira, and through the outskirts of Nchanga and Kitwe. The popular picnic spot the Hippo Pool north of Chingola is protected as a national monument. In the Copperbelt, water is taken from the river to irrigate small farms and market gardens. At Kitwe it changes course to the south-west and flows through forests and areas of flat rock over which it floods in the wet season, keeping to a channel about 50 m wide in the dry season. It then again develops intricate meanders and a maze of channels in a swampy floodplain, with oxbow lakes and lagoons. It flows 20 km west of the permanent part of the Lukanga Swamp which fills a circular depression, and which drains through a channel into the Kafue. The area between the swamp and river is flood plain and when that and surrounding areas are inundated in the rainy season, the combined wetland exceeds 6000 km². This is the first of the three main wildlife areas of the river, and the least surveyed and protected. The character of the river changes again, as it forms a less meandering dry-season channel with sandy banks and islands. Continuing south-west it enters the Kafue National Park, second largest national park in Africa, where it receives its two largest tributaries, the Lunga and Lufupa rivers, also from the north. The Kafue skirts the south-east edge of the Busanga Plain, one of Africa’s premier wildlife areas, known for large herds of cape buffalo, zebra and antelope. In the rainy season the Lufupa floods the plain. Like the upper Zambezi, Okavango and Cuando rivers, the Kafue used to flow south all the way to Lake Makgadikgadi and the Limpopo River, but the land in that area was uplifted. A rift valley formed running due east of where the Kafue National Park is now, and the Kafue river, eroding a channel called the Itezhi-Tezhi Gap through a ridge of 100 m high hills, became diverted eastwards. The Itezhi-Tezhi Dam was built in 1977 at the gap and now forms a reservoir 50 km long and up to 10 km wide. In its journey east, the river flows sluggishly across a flat plain called the Kafue Flats (formerly Butwa after the Twa people) and for the third time develops intricate meanders in a maze of swampy channels and lagoons. This time however it also has an immense shallow flood plain which no roads or railways cross, 240 km long and about 50 km wide, flooded to a depth of less than a metre in the rainy season (deeper in some lagoons and permanently swampy areas), and drying out to a clayey black soil in the dry season. The Kafue Flats are the third major wildlife area of the river. Tens of thousands of Kafue Lechwe live on the Kafue Flats and are adapted to wading the flood. The area also has one of the greatest variety and concentrations of birds in the world. The Lochinvar and Blue Lagoon National Parks have been established on the flats. Around Mazabuka and as the river gets closer to the town of Kafue, sugar plantations and other large agricultural estates have been established on the fertile black soil and use water from the river in the dry season. The Kafue Flats end at Kafue town and from there, as the rift valley gets deeper, the river drops 550 m over 60 km through the Kafue Gorge. A second dam, the Kafue Gorge Dam, with a smaller reservoir, generates electricity. The lower Zambezi (originally a separate river) cut back through the rift valleys and eventually captured the Kafue. Their confluence is about 20 km north of Chirundu. As it flows through the Copperbelt the Kafue River is at great risk of pollution, not just from urban waste but from copper mine tailings. The swampy areas west of the Lukanga Swamp help silt and pollution settle out so that the river becomes clear downstream. A report in April 2002 said: . . .natural wetlands are quite effective at controlling water pollution from mining in the Copperbelt . . . Tests show the Kafue to be clean of mining pollutants downstream from the Copperbelt. In the Kafue flats, discharge of phosphates in excess fertiliser run-off from commercial farming and the Nakambala Sugar Estate can cause algal blooms and weed growth, reducing fish populations. Because of its size and geographic location, the Kafue River basin is an ecosystem that provides services and support to communities and industries that have different and sometimes conflicting interests in usage of the river resources. In 1999, the World Wildlife Fund (WWF) initiated dialogue between the Zambian Government, the Zambia Electricity Supply Corporation (ZESCO) and local people to restore a more natural flow pattern to water releases from the Itezhi-Tezhi Dam built on the Kafue River. This project heavily influenced development of Zambian Government policy on water resources and in February 2010, the Zambian Cabinet approved a revised National Water policy that "aims to improve water resources management by establishing institutional coordination, engaging in modern methods of integrated water resource management while decentralising government policy to address diverse interests within the water sector". These have had major negative environmental effects on the river — see main article on the Itezhi-Tezhi Dam. Commercial plantations especially those bordering the Kafue flats take large quantities of water for irrigation. Chief of these is the Nakambala Sugar Estate, which draws in excess of 720,000 m³ per day to irrigate 134.13 square kilometres of land to grow sugar cane. ↑ 3.0 3.1 3.2 3.3 American Association for the Advancement of Science website: H N. Weza Chabwela & Wanga Mumba, “Integrating Water Conservation and Population Strategies on the Kafue Flats”, Report of a Workshop on Water and Population Dynamics, Montreal, Canada, October 1996. ↑ 4.0 4.1 4.2 4.3 4.4 Google Earth accessed 1 March 2007. ↑ 6.0 6.1 6.2 6.3 Camerapix: "Spectrum Guide to Zambia." Camerapix International Publishing, Nairobi, 1996. ↑ Blacksmith Institute website: Zambia Country Report (April 2002) accessed 1 March 2007. This page was last edited on 16 November 2016, at 13:59.